If Spring is all about getting more active, it’s extremely important to make sure our bodies have the energy to enable this extra activity. Running, cycling, taking extra classes at the Yoga studio, or simply getting outside more are all brilliant ideas when it comes to this more Kapha-based time of year (If you’re thinking…. Kapha-what? Click here), and coupling that with snacks that support us through the day will help to keep mood and energy levels high! Dates have a considerable amount of vitamins and minerals which makes them a good source of food for keeping bones healthy, as well as maintaining the activity of the digestive tract – preventing constipation and that awful bloated feeling after a big meal out…. Vanilla extract relaxes the nervous system and can actually be rubbed into bruises as a natural healing aid. The ingredient is high in antioxidants and can also help in lowering cholesterol levels. Pink Himalayan mountain salt contains all the natural minerals our bodies need, and can be added into any dish for a nutrient boost. It also maintains healthy functioning of metabolism, and helps the intestines absorb nutrients from other foods. Cinnamon balances blood sugar levels, therefore keeping energy and mood levels stable for longer, it’s also the perfect sweetener to use when avoiding sugar as it satisfies sugar cravings without subjecting the body to toxicity. This recipe makes about 20-25 stuffed dates. 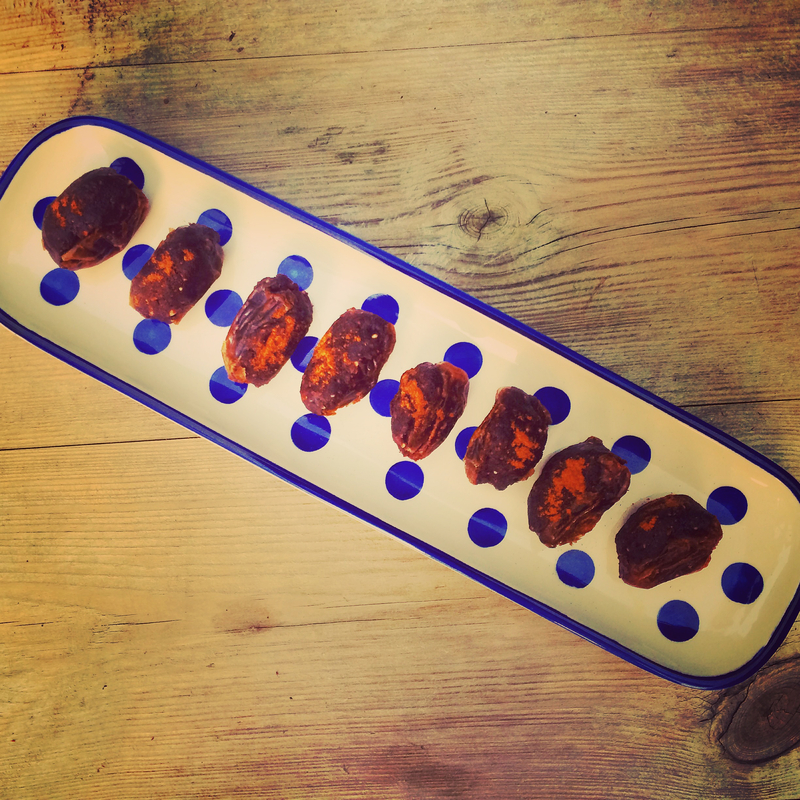 Use dates which have stones in means they’re the perfect size and shape for stuffing. All you need to do is make a slit down the side, remove the stone, and open the date out like a book. Do this 20-25 more times and you’re ready to fill them…. Add all other ingredients to a bowl and mix well to combine. Scoop a tsp of the mixture into each date and then squish the date halves together. When stuffed, sprinkle the dates with cinnamon and keep in the fridge until they’re undoubtedly devoured by everyone! Feed your mind, feed your body, feed your soul…. So, I want one of these right now. Such a great, simple idea! ← Practice: Vasisthasana & Variations. Cultivating space & strength in the shoulders, and practicing without pain….